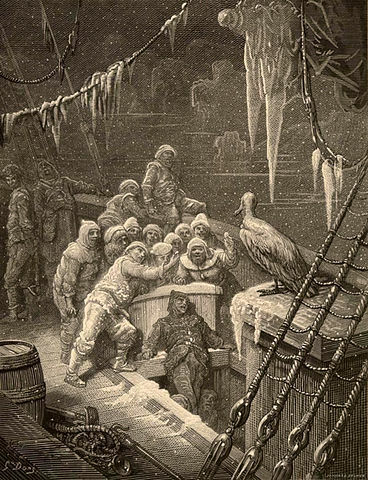 Coleridge's longest and most famous poem, The Rime of the Ancient Mariner (original spelling "The Rime of the Ancyent Marinere") is often quoted by those who have never read his work. The metaphor, "having an albatross around one's neck" and the quotation, "water, water, everywhere, and not a drop to drink" [the verse is actually "nor any drop to drink"] are a credit to Mr. Coleridge. It was originally published in conjunction with William Wordsworth in Lyrical Ballads, With a Few Other Poems (1798). Vivid woodcut illustrations by Gustave Dore. Try one of Coleridge's other works such as The Nightingale, a Conversational Poem (1798). Add The Rime of the Ancient Mariner to your own personal library.